On March 26, New Orleans Coca-Cola Bottling Company announced that they have been honored as the official soft drink of the Jazz and Heritage Festival for another year—but this is more than just another year in the books. 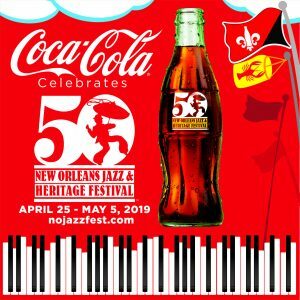 Jazz Fest celebrates their 50th anniversary this time around, and Coca-Cola has unveiled glass bottles with the 50th anniversary logo to commemorate the occasion. As you may know, glass is prohibited inside the perimeter of the festival. So, make sure to look in stores across the city of New Orleans for the 50th anniversary Coca-Cola commemorative bottle celebrating the New Orleans Jazz Fest happening on April 25-28 and May 2-5. New Orleans hosts their Jazz and Heritage Festival, or Jazz Fest, every spring to raise a toast for the music and culture of New Orleans and of Louisiana as a whole. The festival attracts tens of thousands of visitors every year to eat, drink, listen, and enjoy what the city and its unique culture has to offer. Jazz Fest, which takes place across two consecutive weekends, has taken several steps to make their 50th anniversary special, including adding an additional day reserved just for Louisiana locals. They are calling this day “Locals Thursday,” and any fest-goers with a valid Louisiana State ID will have access to specially-priced tickets. The event will be held at Fair Grounds Race Course and Slots, A Churchill Downs Company. Their show-stopping lineup this year includes Earth, Wind and Fire, Jimmy Buffett, Al Green, Diana Ross, Pitbull, Leon Bridges, and more! 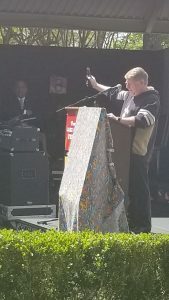 At the press conference on March 26, Jazz Fest Producer and Director Quint Davis held up the commemorative bottle as an example of one of the many ways that the 50th anniversary of the festival is being celebrated. Jazz Fest fans, shoppers, and collectors will all be able to grab a 6-pack of 8-ounce 50th Anniversary Jazz & Heritage Festival bottles of Coca-Cola from participating retailers across the Greater New Orleans area, while supplies last. The packaging highlights the festival’s anniversary, and the bottles themselves feature the Jazz Fest 50th anniversary logo. In addition to having access to the special edition bottles across the city of New Orleans, Jazz Fest goers will be able to enjoy Coca-Cola products at concession stands on the festival grounds, including Coca-Cola, Diet Coke, Coca-Cola Zero Sugar, Sprite, Gold Peak Tea, Dasani waters and Dr Pepper. This year continues a New Orleans Coca-Cola and Coca-Cola Bottling Company UNITED legacy of partnering with local festivals, sports teams, organizations and institutions, which has been a commitment for both for more than 117 years. We invest in these events to promote enjoyable, memorable experiences and to provide quality products for the local community.